Crowd funding seems to be growing in China according to this CaiXin article, highlighting DreMore and DemoHour. Both of these sites are in Chinese but if you can view the pictures and if you are using Chrome you can see the translations. Tagged with china, crowd, funding. Neilson and Comscore have both released cell phone data today. Neilson have a nice graphic showing US phone usage. With 30% now using either iPhones or Android and as result having access to a more extensive range of applications. It isn’t clear what proportion of consumers still have no cell phone at all but it does also mean that 70% of consumers don’t have access to an application store worth mentioning. Things are more promising for 25 to 34 year olds where 62% have a smartphone. While it isn’t stated their is probably a higher proportion of iPhone and Android phones among that 62% as well. Probably something around 50% of consumers in the age range have access to an effective application store. There is a graph of the usage by age range here but the full text requires payment. Comscore, who surveyed 30,000 mobile phone users has figures for the proportion of cell phone users (87%) and shows Android with a very similar 48.8% of smartphones of which 25.3% are from Samsung the largest manufacturer. LG have 20.6%. Apple added 1.3% of all mobile subscribers in the preceding 3 months. Android’s growth of 4.6% of smart phone subscribers coming at the expense of RIM. The iPhone 4S won’t be reflected in these numbers yet as they show until the end of September. 43% of all mobile subscribers use their web browser and the same number also have downloaded applications. 71% have sent a text message. This is similar to the proportion of people who use Facebook at least once a month. Comscore’s released information can be found here. My conclusion would be that about 40% of people are actively using digital mobile technology and that this is going to continue to increase as people replace phones and become aware of benefits at a rate of a couple of percent per quarter. Maybe hitting 55% over the next 18 months (The numbers we have are 2-4 months delayed). After that its going to be a slower haul to get the next 15%. In addition, online now competes with press and outdoor when it comes to reach, GfK found. Digital campaigns reach on average 33% of the online population, while press reaches less than 40% — and outdoor just 30%. The nice thing about the published uplift numbers is that it gives a way of assessing what the different channels are likely to be worth to you. They also point out that 25% were reached by online advertising but not by television. If a TV CPM were costing you $20 your might be willing to pay some proportion of $120 for a Google Search CPM. However there are only a limited number of people being reached by effective Google Search CPMs so your budget is then going to sill over into display advertising at some discount on $25 until you weren’t reaching as many additional people and were spilling over into the world of outdoor and TV advertising. Even if people don’t believe these numbers if gives some heart to only advertising based sites that advertisers are going to read reports like this and start to be willing to increasingly spend more significantly on display advertising. If you are advertising online yourself it’s worth noting that the short term sales uplift was over five times greater with Google Search (Presumably discriminatingly spent) than with display advertising. The long term brand benefit tends to still be discounted. As of the end of October 2010 Subtle Tea is closed. 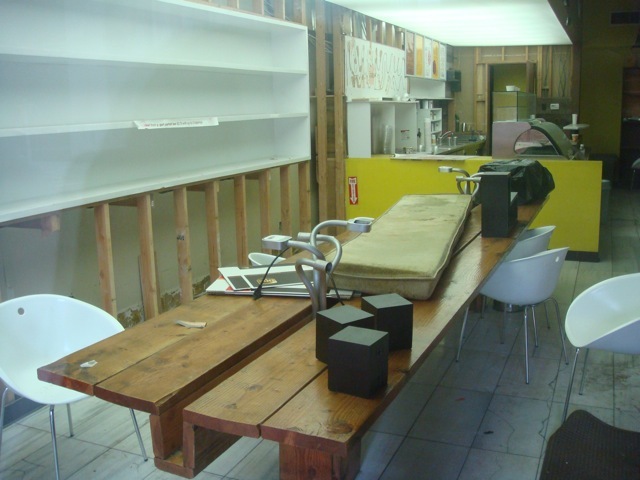 They have lost their lease and the fittings and fixtures laying abandoned in the space. Should Your Web Startup Avoid Providing Telephone Support? There are many apparently very important web businesses which don’t provide customer support. At least not the expensive telephone variety of support. Facebook or Amazon for example. Even consumer websites do provide telephone support when they deal with more urgent and financially significant transactions though. Services such as airline ticket or even theater ticket sales. Admittedly they use the airline’s support number during travel, in the same way as retail store travel agents did. Another example on the consumer front is Intuit’s Turbo Tax product which again, because it is a more important, finds itself providing telephone support. Some of these services are so important that customers are paying for the service unlike many well know websites which succeed through scale but have very little revenue per user. It is no coincidence that the paid for services such as travel agents or tax preparation services provide telephone support. If it is important enough to pay for, then most people are going to want recourse to a phone number as a last resort. If the service is free then they don’t expect somebody to be paid to talk to them about it but, particularly if they have paid a significant fee, they expect support to be available. So maybe startups shouldn’t be shying away from businesses which require telephone support. Maybe these needs are an indicator of the types of service that people really care about. Enough to make a phone call. If a service is used in day to day business, such as a reservation system, order taking system, or other client facing website then there needs to be some kind of support if the client’s business can’t function without it. And that is the kind of thing they are going to actually want to pay for. They are going to be concerned if it is free. The reason Facebook or Twitter don’t need a support phone number is because they aren’t part of anybody’s business workflow. Back in the days of packaged applications being installed on the client’s machine the client was in control. The user was part of the release process and chose when to install a new version. They waited until they believed a business benefit would result and there was a convenient time to incur the learning curve. They chose to not make changes at month or quarter end or while staff were on vacation. With software as a service the service provider is in control. As a result if an issue occurs there is a stronger need to communicate and an increased value to support in the software as a service model. The connected nature of the applications means that the service provider is needed to rectify any issue. The client is in a very vulnerable position unless they pay. There are applications which are very generic and as a result don’t require telephone support. The assumption is that the provider is managing their release process effectively. Nobody needs to phone a Google like company to tell them that their home page is down, because if it were their monitoring would have picked up on the redundant components as they failed and obviously everybody else would have the same problem. The same problem. When it is a different problem — things change. As services become more specific to an industry or integration points with other providers multiply the chance of an issue being unique to a small client group increases and the needs of the client to have a customer service relationship and to pay to have influence over the product increase. They will wish to even control the release of the software in use. Something that is occasionally provided on consumer products but is the norm for business applications. To be rapidly scalable the sales process needs to be light which is why startups and their investors tend to focus on consumer products (b2c) but there isn’t a reason to avoid needing to provide support it is just that the managing of the support at scale is a significant part of the business. When it comes to b2b applications then the more widely used applications such as Excel, CRM systems or Quickbooks obviously have more growth potential and a better chance of a rapid multiple, but there are many very viable businesses where much of what the client is paying for is the support processes, and partnership over the product release process. In the extreme cases leading to visibility into the product roadmap but more commonly solutions which allow a selection of modules and defined version points. The habit of hiding in the world of rapid unannounced releases and no direct client interaction is convenient, scalable and maximizes the technical component of the business, but it may be avoiding the software applications that clients are actually willing to pay money for and that would be a missed opportunity. Posted in Business Models, Technology. Tagged with business models, profitable, support. This is more the kind of startup location that makes sense to me. Cheap living for those from out of town and around the clock contribution. It reminds me of the gaming company Code Masters which in the early 90s operated a series of portable trailer sheds in the back yard of the Darling brothers’ parent’s farm house near Gloucester in the UK. They leased these sheds out to independent coders who then contributed their efforts to projects like a row of bungalow occupants on the Universal back lot. Planning permission at that time, and maybe still, allowed you to do this as long as the location was a farm! All part of the fun. Toys there consisted of people clubbing together to buy a power boat as well as a hundred and one video games that were in development around the site. Given the cost of living space in New York it surprises me that only a couple of startups have used residential space. 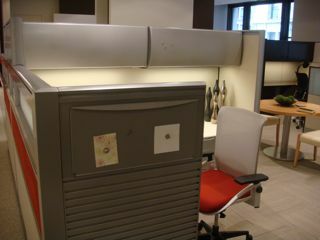 Living costs are much more of an issue for people than office space and it would seem to kill two birds with one stone. It’s literally a sweat shop but it’s a way of getting things done. Posted in New York, Space, Staffing. Tagged with codemasters, home, newyork, office, Space, startup. 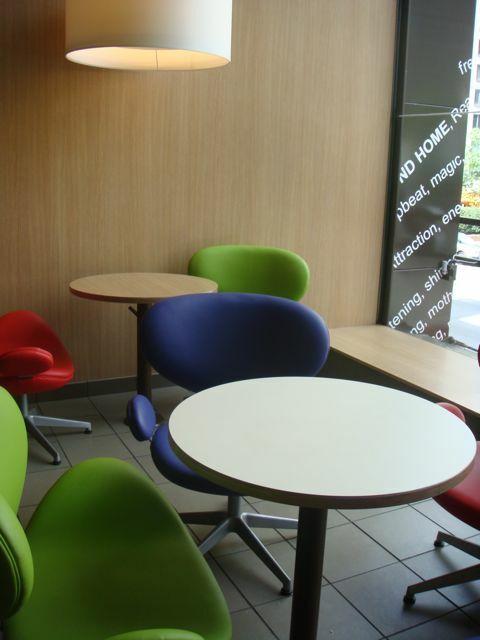 McDonald’s, the New Starbucks for Laptop Users? 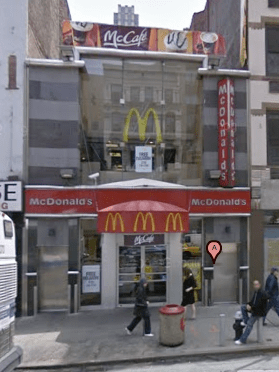 McDonald’s has refurbished a Manhattan store at 85th and 3rd Avenue in a style that I have never seen before. Not only is the interior far more design conscious, it also satisfies many of the needs of the modern day 3rd place. That place which is not the home, nor the office — a market that has so far been dominated by Starbucks. Passersby are looking into the window of, what is after all just a McDonald’s, starring at it and trying to figure out what it is. It is actually fun seeing people’s reactions as they walk past. The expressions are a combination of confusion and delight. It is great to see a shop front having that effect. Why the light green colors? Why the swirling thumb prints of words on the store front? Even from the street it is clear that the interior is something that we are more likely to associate with an airport in Europe than the familiar fast food brand. Looking out towards the entrance. Lighting and color surrounds you. Bright colors are used throughout in a way that reminds me of Migros (A Swiss and Turkish supermarket chain which uses orange) or Coffee Day (A fun Indian coffee chain where there is a lot of red and chrome) or even Mexican calendar posters of hillside houses or maybe just the Ikea restaurant. The light wood screens are used both downstairs, before the counters, and upstairs to break up the line of sight and give a feeling of separate spaces. 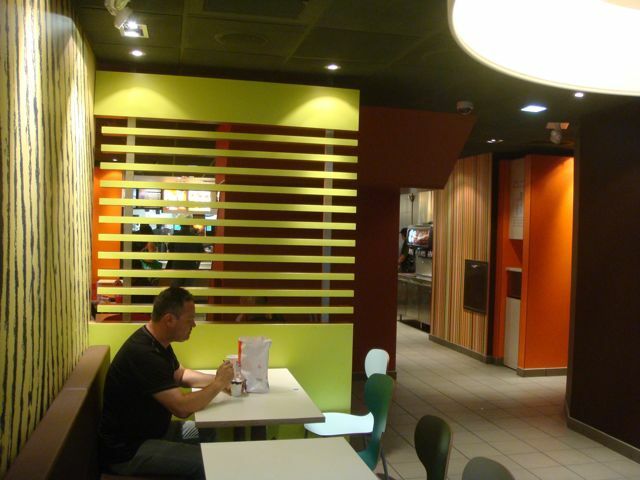 It is a stark contrast to the less-welcoming orange plastic seats we may remember from traditional McDonald’s stores. 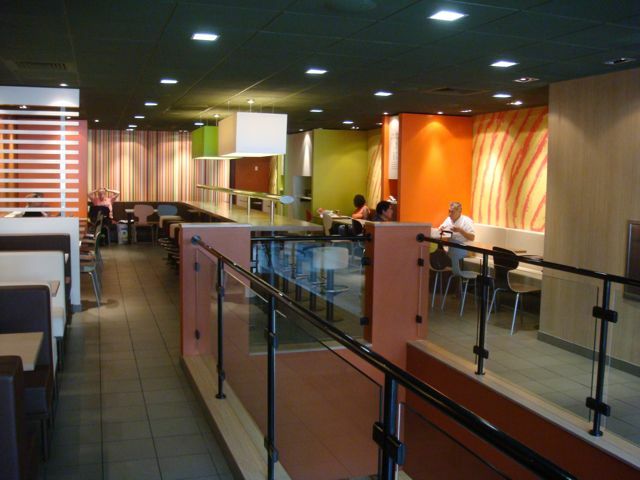 The lighting also adds to the color, highlighting alcoves, condiment areas and bins. The real surprise though comes when you go upstairs. 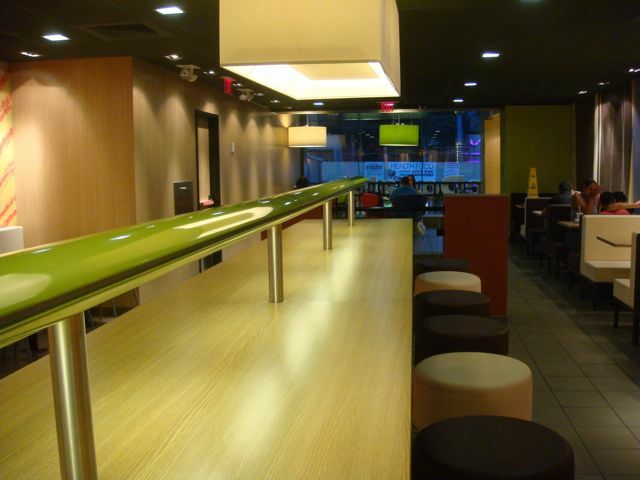 In front of the floor to ceiling plate glass are circular tables with loose colored seats. 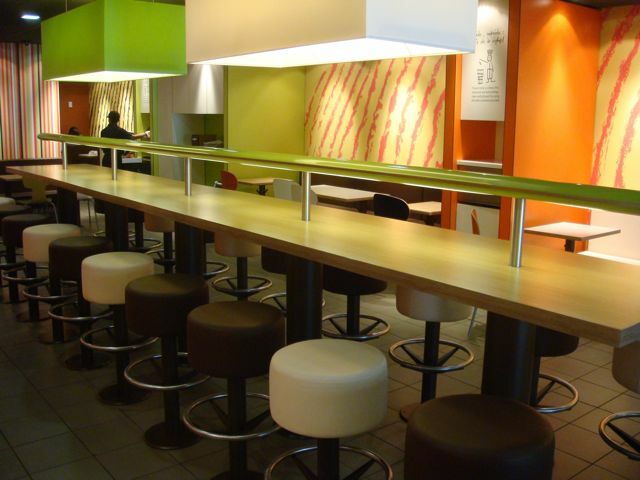 Loose seats are unusual in a fast food store because they need to be repositioned and could become victims of horse play. Loose seating is provided at circular tables with a view of the street. Then as you turn around a long room awaits you, with a series of booths. 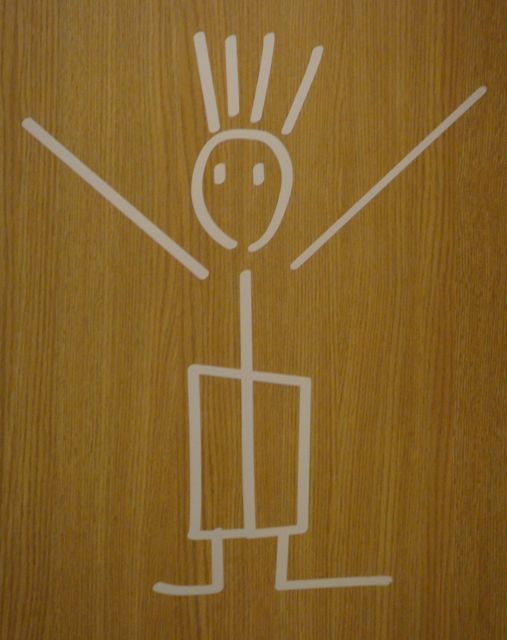 The restaurant reopened only two weeks ago and the facilities have yet to be found, so there have only been three or four people there on the two occasions that I have visited. The second floor interior which is divided into four spaces. The second floor is divided into four spaces. Firstly the circular coffee tables already mentioned, then a series of booths, again with the slatted wood dividers breaking up the space. Then a second series of smaller tables around, of all things — a laptop lane! More of that later, but the room ends in an alcove room beyond the main room and alongside the restrooms. During my visits this space has largely been used by the staff, to take a break, but provides almost an anteroom feel. The laptop lane is of course the more important feature for those meeting others or working from adhoc locations between appointments. It is a long counter table that seats sixteen people. The laptop lane has lighting, power and hooks for bags. 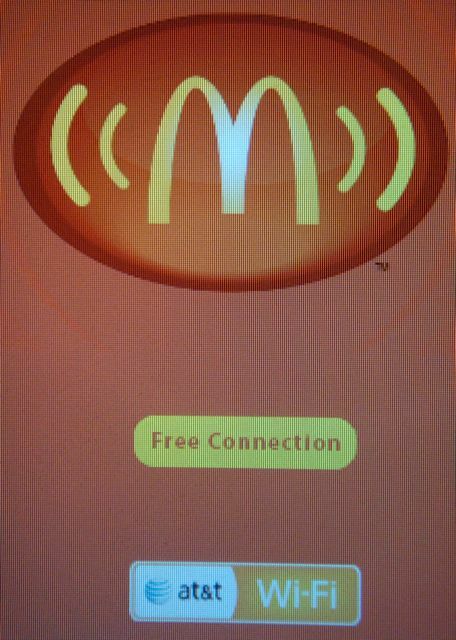 Now, if you haven’t heard, McDonald’s has been providing free Wi-Fi using AT&T / Wayport as its provider for several months now. The service is adequate though using it for a video Skype connection I was told that it was more jittery than on my usual connection. Now that the internet needs of the mobile worker are met, what about power? This is where the laptop lane really steps the pressure up for Starbucks. 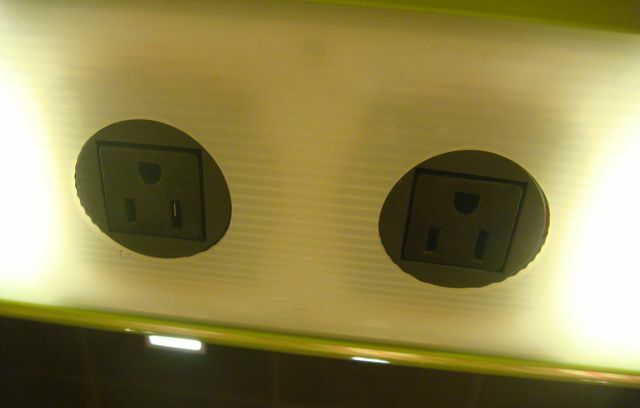 Between each of the light units of that lighting strip that you see over the counter are a pair of power outlets. It was after finding these lighting strips that the location really started to have more potential. If you have travelled from coffee shop to coffee shop, you know that so many locations tease the laptop user by providing Wi-Fi connectivity but not power. Making real work of any duration impractical. Starbucks, and a very small number of independent locations, have a Wi-Fi service that has adequate bandwidth and is maintained effectively enough for the trip not to be a very chancy potential waste of time. The combination of a reliable internet connection and power is the key. Barnes and Noble, for example, do not provide power. Independent locations tend to have fewer tables in NYC, so at the weekend it isn’t really considered polite to be hogging them for hours at a time. Other niceties are that the second floor is largely empty so far, and the fun way the designed interior is completed with friendly signage. There are no signs asking for a maximum 20 minute seating time. The environment is positively welcoming. While the location is very nicely designed, it leaves one obvious area which may be an insurmountable barrier in attracting the beautiful people from Starbucks. Yes, the food. Having now tried both the breakfast menu and an angus burger in good faith, I can’t say that I want to eat them more than I have to. The food is really too salty, and the fat and sugar levels make it incompatible with a regular laptop location. McDonald’s have succeeded in building a location which fits with the attempt of the McCafe branding to broaden the audience (this location is no longer a McCafe) but the location, not only would allow McDonald’s to sell a healthier set of meals, more suitable for regular consumption, but actually seems to call out for it and even to need it in order to be popular. It runs the risk of attracting a non McDonald’s customer who isn’t going to be able to buy more than a coffee. One other potential problem is that the stools in the laptop lane area are fixed to the floor, which can become uncomfortable over time. I was certainly finding that I desperately wanted to drag the stool around a bit to adjust for comfort while using the laptop at an effective angle. Having said this, it was workable, and could even be used for small group meetings or as a coworking space and will definitely give Starbucks a run for its money. One also has to wonder how many people will pay $30 per day, or $50 and up per month, for a coworking space elsewhere, if they find like minded friends migrating to quiet second floor facilities like this which are free and at a more local location. 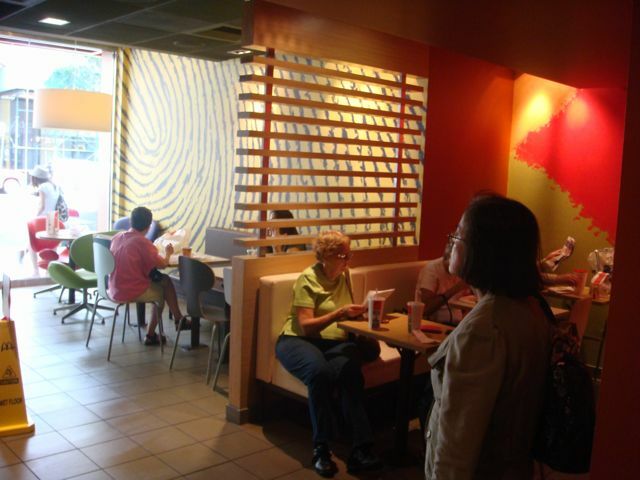 For McDonald’s the store design would appear to be more about winning customers from Starbucks than it is about maximizing the bottom line from existing customers. As such it is a gutsy move in the current market. 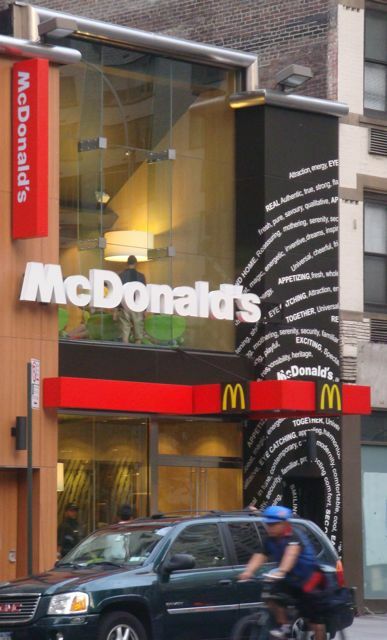 So, very much to my surprise as somebody who is health conscious and has watched Super Size Me, I am adding a McDonald’s to the list of coffee meetup places in Manhattan with both Wi-Fi and power. And yes, some people do just eat burgers here. The store at 1499 3rd Avenue and 85th Street (2 minutes from the 4,5,6 at 86th Street) is open twenty four hours a day though the second floor is only open from 8am to 8:30pm. The location is a 7,500 square foot company store, leased by Golden Arch Realty Corp., IL. The 'before picture' from Google. Compare it with the first picture above of the same store. Posted in Coffee, New York, Space. Tagged with 3rd place, coworking, laptop, laptop lane, mcdonalds, starbucks. People often pitch ad-based revenue models for sites with very small niche markets without acknowledging that the business will only be viable once the market has been greatly expanded. Sometimes this is just a simplification, but often it is because it just isn’t obvious how small the ad-based model revenues can be. These tables provide a basis for estimating the revenue through the value of 1000 unique visitors per month. The revenue needed to sustain the business is then divided by the value of 1000 unique visitors to give an estimated necessary number of visitors and the total available market required. The Total Available Market (TAM) is the number of potentially profitable customers who could make use of the product or service. In the case of web advertising, the number of potential users in the target audience of the website. Obviously, there are a large number of variables, so the value is only an indication for a generic business, but should allow a reality check, and in some cases for a more realistic TAM to be planned. Your entire website and the individual pages are considered by search engines and ad networks to be about a list of keywords. The number of keywords is quite limited, so consider the couple of search engine queries which you would most like to be the recipient of. Then list the four or five distinctive keywords from these queries. Google Webmaster Tools offers a method of viewing keywords associated with your site by Google. These keywords are a factor both in organic search traffic as well as ad placement. Consider how closely they match high-valued purchase decisions. For example, does your site review new cars, a classic high-value purchase decision, or is it about pedestrian safety. Clearly the auto reviews are closer to a high-value purchase decision. Think not only about the initial purchase but about the lifetime value of the customer to your advertiser. For example if a consumer purchases cable TV every month for three years then the decision has a considerably higher value than the initial purchase. Other examples which need replacing after use are replenishment items such as vitamins, diapers or books which can total a significant value over a period of time. The majority of online advertising is attempting to solicit a direct response from the viewer. A click on an advertisement which leads to a purchase or registration. As a result if your page is a good home for purchase related topics your advertisers are obviously going to have a higher response rate to their placements. The higher value those responses are to the advertiser the more they are going to be able to spend on competing for your advertising space. Based on your estimate of the lifetime value of customers who are on your site, select a value per 1000 unique visitors below. If your website is not directly related to a spending decision (e.g. pedestrian safety) then use the initial value of 25 cents. Estimated value (V) of 1000 unique visitors per month based on live time value to the advertiser. The majority of websites are not directly purchase-related so in most cases you should be selecting the first row of the table above as the estimate. Compare the value of 1000 visitors to your site with the spread of values within the Google ad network. An advertiser may have paid Google AdWords over $1.00 for 1000 individual impressions where as AdSense will have paid out to the average site less than 25 cents for those 1000 impressions. Sites more in demand by advertisers will be paid a higher proportion of the AdWords revenue. The fluctuation of this demand in the auction-like algorithm from time slot to time slot across the week makes predicting the revenue an inexact science. Affiliate networks will provide a greater return (V) than ad networks, often due to the web site content being more closely related to the advertisers proposition, and as a result providing a more effective funnel for customers. The content needs to be more tailored to the advertiser to get the full benefit. The affiliate model can also be used to avoid the margin taken by an intervening ad network. For example, most marketing on Facebook is priced on an affiliate basis and manages to be targeted using the additional information about the user, including their reaction to other advertising, their networks reactions and memberships. Note here that V is related to, but different from the CPM, the value of 1000 impressions. There are likely to be multiple advertisement impressions shown to a visitor over a month, and on a single page, however you will not have many effective advertisers for any individual so the benefit quickly diminishes unless the site has time to learn about the user and place better advertising. A single well-targeted advertiser is more valuable than showing twenty different advertisers to the user across the month. Subsequent impressions of the same advertiser have a diminishing chance of being clicked upon or at least have a probability as a sequence, that may build with credibility for a less known brand, but which doesn’t grow linearly with the number of impressions. Here, we are using a simple model based on the number of unique visitors regardless of the number of impressions or different advertisements displayed. Most websites have an average of less than five page views per unique visitor per month as approximately half of visitors will view only a single page. If you can command your user’s attention for periods of time – or even a few hours per month – then your value (V) from the table above may be a multiple greater than that shown. Facebook, for example, made a revenue of $700 million in 2009 from approximately 400 million registered users. If we assume an estimate of 350 million unique visitors per month then their value per 1000 unique visitors was approximately ($700 million / 12 / 350 million) * 1000 = $167 per month per thousand unique users (V). This is due largely to the fact that they achieve many hours of usage per month from their median user. This is extremely unusual – if not unique, but still only $2 per user per year. An average site as generic as Facebook is receiving below a dollar as the median user leaves within a few seconds and does not often return. Many parked domains actually have a better defined audience than normal websites and can receive $5 to $10 per 1000 unique visitors. The lack of content makes following an advertisement actually more likely. Sites which have users returning to them rather than being driven by search results can have heavy monthly usage per user and as a result require a second method of establishing the value of 1000 unique visitors based on the number of pages viewed or the amount of time for which they can be held on, or caused to return to, the site. Having the user on the site for longer allows greater opportunities to gather data on the user and to fine tune the advertising. It also implies a stronger bond with the site and allows the sale of advertising space in greater quantities to more significant advertisers and possibly by a more direct sales process. For sites with significant user stickiness, which implies loyal readers, or addictive games, there may be significantly greater revenue opportunity, and it would be fair to use the greater value for V of those shown in the tables above and below. Estimated value (V) of 1000 unique visitors per month based on total monthly stay. Very few sites have a median visit of greater than five minutes but it does occur for popular newspapers and for the most popular online games. For the largest of purchase decisions, of a house, car, medical plan, or cell-phone plan, it may be reasonable to assume that a site may have significant duration of reading, in addition to being related to the purchase decision giving a high valuation. The difference between obtaining value from effective strategies, such as the duration of usage or closeness to a purchase decision, rather than less effective ones, such as large numbers of transient users, is key to debates such as Rupert Murdoch’s preference for loyal readers and shunning of search-driven momentary visitors. Typical newspaper content isn’t directly focused on a purchase decision but it also illustrates the ability to play both the high duration and high value purchase decision strategies simultaneously. It isn’t a coincidence that major newspapers have supplements for real estate, automobiles and high-end travel as these are all high-value purchase decisions. The higher end of the range of unique visitors needed is more typical but the range is based on the value (V) of 1000 unique visitors. The model also assumes that your visitors are organic and that you have no other significant costs other than your sweat equity. Obviously if you are, for example, using paid search marketing with costs typically of $0.25 to $2.50 per visitor you will be paying out far more than you are receiving. Based on your expectations above, take the value of revenue (R) above and divide it by the value of 1000 unique visitors in the first table (V) to achieve an estimate of the number of thousands of unique visitors needed (U). Say $25,000 for a commercial office sized business / $0.25 per thousand to give 100 million unique visitors per month being needed. There are sites which achieve this, but not many. In fact only Facebook, Google, Yahoo and MSN. You need more traffic than e-Bay! Take a look at Compete for a list with unique visitor counts. (Unfortunately they now charge for the full list but you can also query individual competitor sites). Remember that it isn’t reasonable to expect to have every member of your chosen market demographic. It gets increasingly expensive to obtain the more reluctant members of any demographic. For arguments sake, lets say, that you are very optimistic and believe that you can reach 5% of your chosen demographic. Your demographic had better be small and reachable with your message. Lets say bicyclists in Brooklyn. We need to multiply the number of unique visitors (U) by twenty to see the Total Available Market (TAM) size required to support your site. Do remember that not everybody is like the people you know, over 99% of people on Earth do not own an iPhone, the majority of people are not between 18 and 30 years old, etc., etc. For our example of a business wanting to pay for a commercial-office sized business we would need a TAM of 2 billion people. Since the number of bicyclists in Brooklyn, is significantly lower you may conclude that you need to plan to target a broader market. There may, barely, be 2 billion cyclists on Earth. Alternatively you could accept that your business will be part time unless you are able to finance going to a wider geography or develop a different business model. The aim here isn’t to be exact but to have approximately reasonable expectations and to select a business model and total available market which are plausible. You can expect to have difficulty obtaining funding if the TAM required exceeds the available market which the business can be expanded into. Wider understanding of the limitations of the ad model are an important reason why other business models such as subscription services or data monetization have become increasingly prevalent. Your business’ growth is also restricted by the fact that there are just under 2 billion internet users – with only about 300 million preferring to read English – and you can’t generally assume that you have more than a fraction of 1% of them visiting your site any time soon. For websites with longer time being spent on the site, the amount of available free time on the part of users is a limitation. It would be possible to show that currently, globally, less than 2000 sites are likely to have over ten million people spend more than an hour per month with them. The public usage statistics would appear to show that fewer than fifty are actually achieving this, and that usage is far more fragmented down below a level at which a VC would find it attractive to fund any but the most popular sites based on an advertising model. As a result, the most viable advertising model based sites would appear to be those with content closely related to purchase decisions. They can have modest success with advertising and be able to sustain themselves as corporations if they can reach over ten million people per month. Greater success, of the size that might attract VC funding, (over ten million revenue per year) would appear to require very broad usage indeed. Reaching over ten million people for more than an hour per month. This is currently achieved by sites such as news outlets CNN and the New York Times, and more general sites such as Facebook. Not that these news outlets could be sustained by these amounts of money. Facebook is also making considerably more money with its exceptional usage levels. Sites with addictive games and entertainment with a broad appeal might also achieve the same usage at a modest cost. The long tail of general content is unlikely to be supported, as a corporation, by advertising other than by very large, low cost, content farms that can achieve the number of visitors necessary to cover their overheads. Advertising isn’t a model which can sustain long tail sites. It is only going to be significant for the largest of sites and almost none of those will be large enough to give a sufficient return on a classical VC investment. P.S. I would be very pleased to hear of additional data points which can be used to verify, adjust or disprove the tables in this post. Tagged with ad, business, models, revenue, startup. A recent meeting on behalf of the Center for Digital Media underlined why office environments are laid out the way they are. Lets start with the walls. The walls can either be built of plasterboard and be solid objects or constructed of prefabricated reusable panels that are held in place by metal trim tacked to the ceiling and floor. The solid walls are far cheaper than the reusable movable panels to purchase but the solid walls are a capital purchase. Something which is part of a building structure has to be depreciated over decades where as movable walls can be depreciated within ten years. An 8 foot partition may cost $200 per linear foot where as a full height partition wall will cost $300 to $600 per linear foot. Compare that with a permanent wall which might be as little as $40 per linear foot. Given that two walls are needed to enclose an additional room the length involved can be around 45 feet. So the cost of a fixed wall is only $1,800 where as movable walls could cost around $20,000. Contrast these costs of $1,800 to $20,000 plus furniture and the cost of 400 square foot of real estate ($12,000/annum) with slick open plan office furniture which can be moved at a fraction of the cost and are likely to take up 100 square feet ($3,000 / annum) and will cost just under $1000 per seat. The footprint on the floor area obviously varies depending on the layout and there are options such as three table 120 degree clusters rather than rows which add interest but cost floor space. While in theory full height movable walls can be moved in practice this involves shuffling the displaced area so it is a rare event. It is far more practical to minimize the use of conference rooms and offices and potentially use prefabricated fronts to achieve a dramatic look while using open plan as much as possible. The density of the open plan is really cost driven. Desks can be packed in, even to the extreme of the rows of benches we see in some of the startup spaces. All the layouts have a roll and a price bracket and within an industry there are well defined styles of office which are dictated by the cost of the materials and infrastructure. The challenge is in working creatively with the cheaper fixed wall structures to achieve acoustic privacy where it is needed and to choose flexible furniture which can meet the cost demands of the business in an attractive work environment. Tagged with layouts, office, Space, walls. There are a lot of myths about the subject and with 6,000 audits of mainly small businesses planned for this year the potential costs of 150% of the tax not deducted can be significant. So you need to understand the boundaries a little to avoid your staff being unexpectedly classified. Just a hint, the idea that you are safe as long as they aren’t in the office or are labeled as interns is purely a myth though having to work in the office is an important factor as it often leads to you controlling many aspects of their work. Lawyer Albert Rizzo gave a presentation at Brooklyn Business Library for NY State Small Business Development Center which covered some of the key concepts. The costs to the business are higher for employees though basic income taxes have to be paid in the end for both situations. The apparent costs are also more obvious as you have to deduct tax before paying people and just the sheer form counts are much lower if you can keep everybody as an independent contractor so most small businesses try to classify people as independent contractors where possible. If they are employees then it isn’t the end of the world, you can use ADT or PayChex to handle the processing of deductions for much less than $100 per month per employee. You do have to make sure that you can manage to make the regular payment schedule associated with employees that these services will need to take from your account on schedule. For the IRS the concept is in summary that the person is an independent contractor if the business has the ability to direct or control the end product but not the way the work is done. Now what does that really mean? The type of instruction given: Does the business control: Which tools to use, workers to hire, where to purchase supplies, who does which tasks, the order or sequencing of tasks? The degree of instruction given by the business – How specific is it? Are the financial aspects controlled by the business owner? In addition there are some exceptions, largely created by case law. So for example you tell a building contractor to build a kitchen that has certain characteristics (The end product of the work) but you do not tell them how to do it (Where to buy grouting, in what order to build, who to hire) so they are not your employees. The plasterer owns his own equipment but his tasks are controlled by the contractor so he is an employee of the contracting firm. It was clear from the Q&A at the end of the presentation that for a large proportion of startup businesses there have been oversights in classifying workers. One business owner had concerns about her interns who had not had deductions made and for which the business could potentially be liable. Another had brought a group of performers in from Canada and paid them without deductions and was now being asked to pay the tax on the full amount She had been paid. Clearly she was going to have made a significant loss on the venture and had no way or right to recover the money paid to the performers. I don’t suppose I need to spell out the moral of the tale! You can find similar events through the events list on the IRS site or Brooklyn SBDC. Further details on the question of independent contractor status are discussed at this page on the IRS site. Tagged with Brooklyn, Compliance, emloyee, independent contractor, nyssbdc, payroll, self employed, tax.